Secretary of State Mike Pompeo looks to Secretary of Defense Jim Mattis during a news conference with Chinese officials at the State Department in Washington, Nov. 9, 2018. While Pompeo noted the U.S.-China Diplomatic and Security Dialogue in Washington was "productive," he highlighted China's repression of some religious groups. "The United States and the international communities will continue to express our concerns with respect to China's repression of religious groups — Christians, Buddhists, and 800,000 to possibly millions of Muslims — that have been denied their freedoms," Pompeo said during a joint press briefing following Friday's talks. Secretary of Defense Jim Mattis, left, Secretary of State Mike Pompeo, second from left, Chinese Politburo member Yang Jiechi, third from right, and Chinese State Councilor and Defense Minister Gen. Wei Fenghe, second from right, meet at the State Department in Washington, Nov. 9, 2018. When pressed by VOA during the briefing, Chinese Politburo member Yang Jiechi said those issues are "China's internal affairs" and that "foreign countries have no right to interfere." China says the "vocational education centers" are aimed at ensuring security. Activists say there is evidence of torture, widespread surveillance, and signs that those being held are being forced to renounce their faith. Yang on Friday noted the Chinese government attaches great importance to social and economic development in Xinjiang and Tibet and has taken a host of measures to promote stability, "unity" and people's well-being there. Xinjiang is home to ethnic Uighurs, the region's Turkic-speaking minority, ethnic Kazakhs and other Muslims. During Friday's dialogue, U.S. officials also reaffirmed "strong ties" with Taiwan, which has been self-ruled since the 1940s but claimed by China. "I reiterated the U.S. policy has not changed, and that we are concerned about China's increasing efforts to coerce others constraining Taiwan's international space," Pompeo said. In response to a question by VOA, senior Chinese diplomat Yang noted, "Taiwan is an inalienable part of the Chinese territory," adding Beijing would continue to remain committed to its "One China principle." The nuance between Washington's “One China Policy” and China’s “One China Principle” is that the U.S. stance leaves open the possibility that a future resolution could be determined peacefully by both China and Taiwan. The United States sees Taiwan as part of a network of Asian democracies, and informal Taiwan-U.S. ties have improved under U.S. President Donald Trump. He signed the Taiwan Travel Act earlier this year, which encourages visits "at all levels" between U.S. and Taiwanese officials. 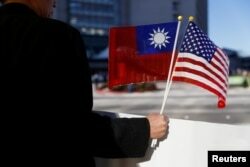 FILE - A demonstrator holds flags of Taiwan and the United States in support of Taiwanese President Tsai Ing-wen during a stopover after her visit to Latin America in Burlingame, Calif., Jan. 14, 2017. "The United States will meet with whomever the United States wants to meet with," the official said when asked whether China was warning against such a meeting. "We have continued concern about China's activities and militarization in the South China Sea," Pompeo told reporters Friday. "We pressed China to live up to its past commitments in this area." Mattis said all military and civilian vessels and aircraft should "operate in a safe and professional manner" in the contested international waters. 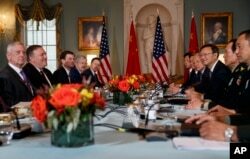 "The United States is committed to finalizing a military-to-military crisis deconfliction and communication framework with China," Mattis said following Friday's talks at the State Department.